The seated cable row is a pulling exercise that works the back muscles in general, particularly the latissimus dorsi. It also works the forearm muscles and the upper arm muscles, as the biceps and triceps are dynamic stabilizers for this exercise. Other stabilizing muscles that come into play are the hamstrings and gluteus maximus. This exercise is one done to develop strength rather than as an aerobic rowing exercise. 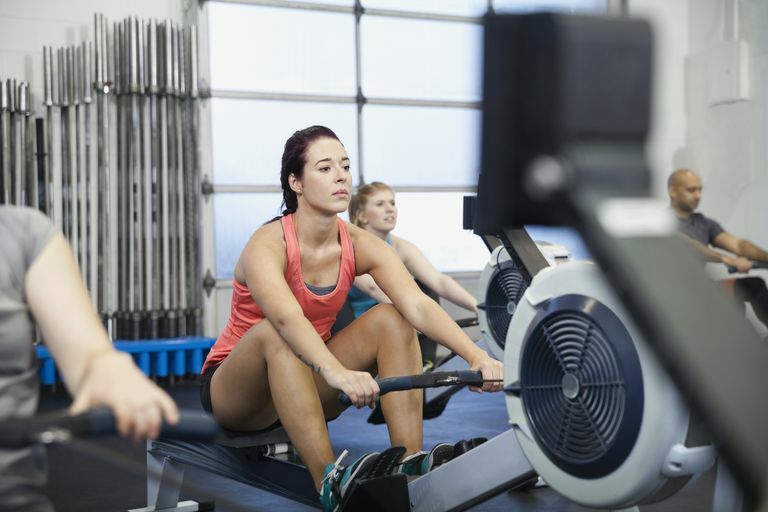 Even though it's called a row, it is not the classic rowing action that you might use on the aerobic rowing machine. It is a functional exercise as many times during the day you pull items toward your chest. Learning to engage your abs and use your legs while keeping your back straight can help prevent strain and injury. This straight back form with abs engaged is one you also use in the squat and deadlift exercises. Sit on the platform with your knees bent and grasp the cable attachment. It often has a triangle handle, but it may be a bar. Position yourself with your knees slightly bent and so that you have to reach to grab the handle with outstretched arms yet without curling the lower back over. Brace the abdominals and you're ready to row. Pull the handle and weight back toward the lower abdomen while trying not to use the momentum of the row too much by moving the torso backward with the arms. Target the middle to upper back by keeping your back straight and squeezing your shoulder blades together as you row, chest out. Return the handle forward under tension to full stretch, remembering to keep that back straight even though flexed at the hips. Repeat the exercise for the desired number of repetitions. Avoid these errors to get the most from this exercise and prevent strain. Your back should be straight at all times, not bent. You can flex slightly at the hip to allow a full range of motion. Use your arms for the motion rather than moving your torso. Keep your torso still throughout the exercise. Return the weight under tension to the starting position. Don't crash the weights and don't pause or bounce at the bottom of the lift. If the weight is so heavy that you are not able to go through the full range of motion with good form, it is too heavy. Reduce the weight and ensure you are getting a full range for this exercise. This exercise can be done in different ways to meet your needs and goals. Start with light weights when you first begin to do this exercise. As your body adapts, you will be able to add more weight. You can change the hand attachment and your grip to target different areas of your back and how much you are using your biceps. A single-arm cable row can also be performed. Keep your free hand at your side while the other pulls the handle toward your navel. This can be useful if you have one side of your body that is much stronger than the other. The single-arm exercise also is more of a core challenge as the muscles much work harder to keep your torso from rotating. Be cautious if you have an existing or past shoulder or lower back injury. You may talk to your doctor or physical therapist to see if it is advised. Stop the exercise if you feel any sharp pain.